Item description: An ordinance by the North Carolina Secession Convention ceding parcels of land formerly held by the United States government to the new government of the Confederate States of America. 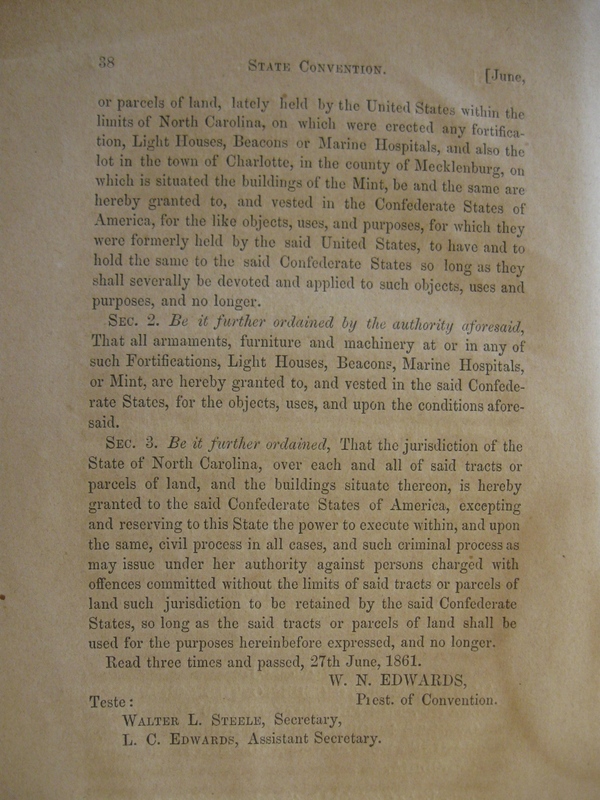 AN ORDINANCE TO CEDE TO THE CONFEDERATE STATES, THE PROPERTY IN AND JURISDICTION OVER THE FORTS, LIGHT HOUSES, BEACONS, MARINE HOSPITALS AND MINT IN NORTH CAROLINA. SEC. 1. Be it ordained by the delegates of the people of North Carolina in Convention assembled, That the property in all tracts or parcels of land, lately held by the United States within the limits of North Carolina, on which were erected any fortifications, Light Houses, Beacons or Marine Hospitals, and also the lot in the town of Charlotte, in the county of Mecklenburg, on which is situated the buildings of the Mint, be and the same are hereby granted to, and vested in the Confederate States of America, for the like objects, uses, and purposes, for which they were formerly held by the said United States, to have and to hold the same to the said Confederate States so long as they shall severally be devoted and applied to such objects, uses and purposes, and no longer. SEC. 2. Be it further ordained by the authority aforesaid, That all armaments, furniture and machinery at or in any of such Fortifications, Light Houses, Beacons, Marine Hospitals, or Mint, are hereby granted to, and vested in the said Confederate States, for the objects, uses, and upon the conditions aforesaid. SEC. 3. Be it further ordained, That the jurisdiction of the State of North Carolina, over each and all of said tracts or parcels of land, and the buildings situate thereon, is hereby granted to the said Confederate States of America, excepting and reserving to this State the power to execute within, and upon the same, civil process in all cases, and such criminal process as may issue under her authority against persons charged with offences committed without the limits of said tracts or parcels of land such jurisdiction to be retained by the said Confederate States, so long as the said tracts or parcels of land shall be used for the purposes hereinbefore expressed, and no longer. Read three times and passed, 27th June, 1861. L. C. EDWARDS Assistant Secretary. Item citation: From Ordinances and resolutions passed by the State Convention. [Raleigh, N.C.] : Syme & Hall, Printers to the Convention, 1861. VC342.2 1861o, from the North Carolina Collection, Wilson Library, UNC Chapel Hill. This entry was posted in North Carolina Collection and tagged beacons, Confederate States of America, forts, hospitals, lighthouses, mints, North Carolina, ordinances, Secession Convention. Bookmark the permalink.